On the night of Friday, Nov. 9, 1872, a squad of Michigan medical students drew up plans for combat. Earlier that day, on a playing field about where the Chemistry Building stands now, the Medics had been handed their hats by a crowd of Literary Department students. The game was an early version of football — a blend of rugby, soccer and rioting, with dozens of players on each side. The Medics were down but not out. They heard that the next afternoon, the freshman and sophomore Lits planned to play another football game, a casual contest among themselves. Most of the Medics were older than the Lits, and — by their own estimate, anyway — heavier and stronger. At least a few were veterans of the Union Army. They were not going to concede bragging rights to a bunch of Lit boys who recited odes and couplets. So the Medics decided on tactics for another meeting with the Lits, and this time, it would be no mere game. On Saturday afternoon, they gathered near the Medical Building on East University (about where Randall Lab is today). There were at least 300 of them. Then they marched onto the field where the young Lits were scrimmaging. 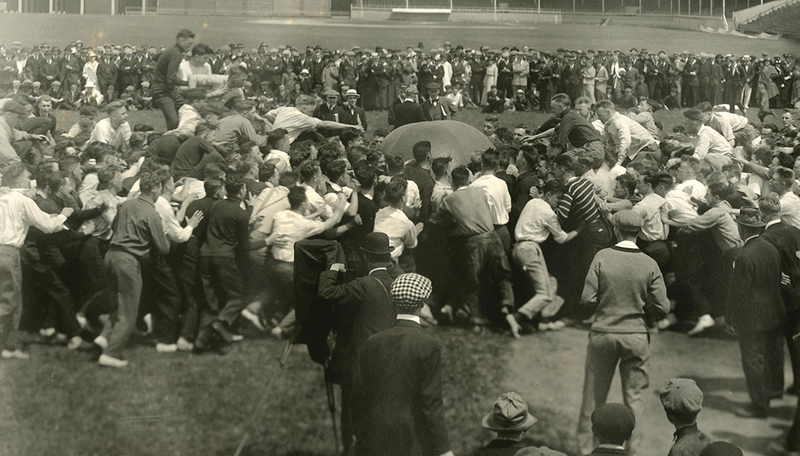 American colleges had seen rushes for decades, and there had been rushes at Michigan at least since the 1850s. Sometimes it started in a classroom building. Shoving would escalate into a concerted effort by members of one class to eject members of another class from the building — usually freshmen versus sophomores. Other rushes were outdoor melees, with each class trying to hurl members of the other class over the picket fence around the campus. The start of classes that fall had brought the usual skirmishes, but nothing like the fight that was brewing when the Medics loomed into view on Saturday, Nov. 10. The young Lits, surprised, asked: Oh, you fellows want to play? The Medics said: No, we don’t want to play. Then men began to shove, and the Great Rush was on. This was the Medics’ side of the campus. By sheer brute force, they aimed to push the Lits all the way across the Diag and over the picket fence along State Street. In the early going, the Medics enjoyed a clear advantage in tactics and numbers. The leaders had recruited virtually all the male medical students from freshmen to seniors. The Lits had only their first- and second-year men — until the noise of the rush was heard across the campus, and the junior and senior Lits caught wind of what was going on. By mid-afternoon, the Medics’ advantage in numbers had vanished. The noise could be heard for half a mile. Townie spectators and noncombatant law students flooded the periphery. After two hours, exhaustion was setting in, and the combat took a new form. Here and there in the mass, a well-matched Medic and Lit would be seen locked in struggle. “Form a ring!” someone would shout, and the primitive straining of man against man turned into a wrestling match. Nearby brawlers stopped to watch. Whenever a man put his rival on the ground, his classmates would seize the winner and hoist him in the air. Then a crowd of the enemy would try to tear the victor down. By now dusk was coming on. The interlude of single-combat struggles had given most of the fighters a chance to catch their breath. With both armies rested, a cry went up to bring the battle to a decision. The Lits’ larger numbers were quickly felt. The mass was now moving slowly but decisively toward the eastern border. Suddenly it was no longer a real contest. The Medics’ forces seemed to dwindle sharply, and in the gathering gloom, the Medics remaining on the field were hoisted and thrown over the eastern fence. Filthy but victorious, the Lits formed up in procession then marched across the Diag and on into town, cheering and singing all the way. There were contesting explanations for the Medics’ collapse. The Lits claimed superiority in strength and cunning. But an interesting theory — offered by a writer who signed himself only as “Medic” — said the medical students had fallen because of a difference in student appetites. The Great Rush may have been the largest but it was hardly the last. It was generally acknowledged that some combination of nature and nurture destined young college men to compete for primacy on a field of battle. But rushes were so dangerous that faculty at Michigan and many other colleges had no choice but to step in. Year after year, professors promoted anything that might channel undergraduate aggression into contests bound by regulations and rituals. But only one sanctioned substitute for the rush caught on and stuck for good — the evolving sport of football. Through the 1880s and ‘90s and into the new century, the game of carrying a ball across a goal line gradually stole popularity from the mass rush. It took on more rules. Mob against mob became 11 to a side. The battle was confined to a sanctioned “line of scrimmage.” And bodies were cushioned by helmets and pads. So when we watch the Wolverines on Saturday afternoons — especially when we witness the collision of the offensive and defensive lines — we are seeing a highly ritualized and rule-bound version of the old rush. The key eyewitness accounts of the Great Rush of 1872 are “The Departmental Rush,” Chronicle, Nov. 16, 1872; “The Rush Again,” Chronicle, Nov. 30, 1872; and “A Campus Rush in the 1870s,” Michigan Alumnus, April 1917. Other sources include Greg Kinney’s “The Evolution of Michigan Football,” Collections (the magazine of the Bentley Historical Library), Fall 2015. A longer version of this story appears at the U-M Heritage Project.